After finishing her first quilt, Rainbow Swift 2, my daughter decided that she would make a doll quilt as a gift for a friend. I think she was inspired by the fact that my son's second quilt, Rainbow Swift, was a doll quilt that he made to her. 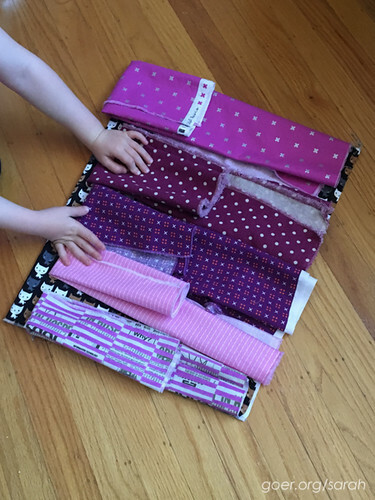 While on our family vacations to Portland and Southern California this summer, she chose some fabric to start her own stash. For this project, she picked solely from her stash. Her first choice was to use the cat fabric for the backing. 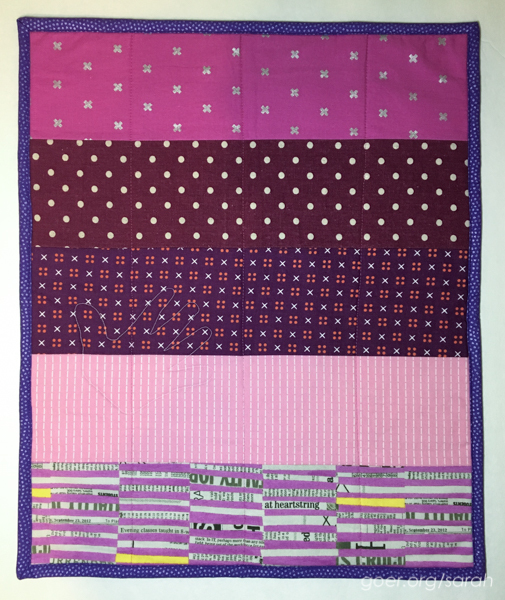 Then she chose the "stripes" of fabric for the front of her quilt. 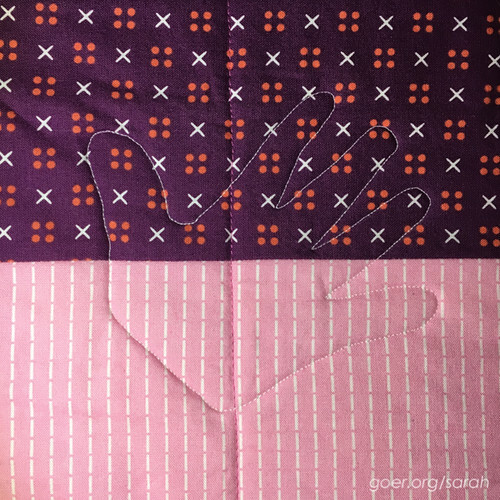 She opted for simple lines of quilting (similar to her brother's quilting on Rainbow Swift, but going perpendicular to the stripes of fabric) and wanted to add the quilting of her handprint like we did on her first quilt. I traced her hand and free motion quilted that part. I keep remnant binding pieces to use on small projects and for scrappy bindings. She initially chose two pieces of binding from my remnants, but when I was making additional purple binding for my own project I offered to make enough extra purple so hers would be all one fabric and she liked that option. Last weekend we were finally able to finish up the quilt by attaching the binding. Now to deliver it to Ellie! Posted in Quilting. 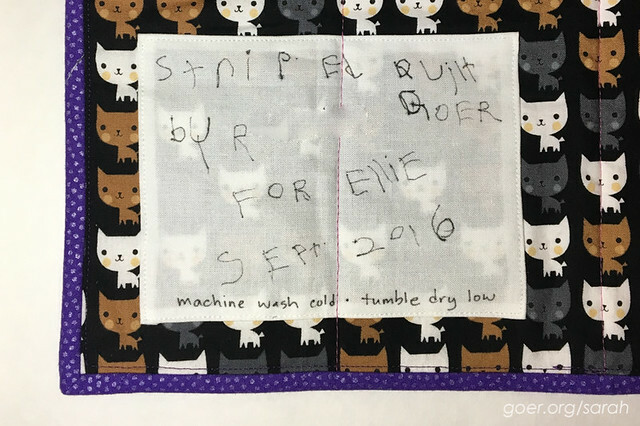 Tags: doll quilt, finished quilt, quilting with kids on October 22, 2016 by sarah. Great post Sarah. It's a wonderful quilt. I can see that like you , your daughter loves purple. Do you know what that fabulous fabric with the text print is? Thank you, Lisa! I don't know what the text print is. She just had a fat eighth of it. She has a great eye for fabric and color. I can also see that she likes purple a lot, too. I hope her friend Ellie enjoys the gift! The apple doesn't fall far from the tree. :-) Thanks for visiting, Yvonne. I love the handprint. And it seems she also have a love of purple. I hope her friend likes it. I hope we get to deliver it soon. I'm sure Ellie will adore it. Thanks for visiting, Anja.